Would you make a good composer? Take our career test to find out how you match with this and over 800 other careers. What is the workplace of a Composer like? A composer is someone who writes and directs original music used to produce various types of media entertainment. 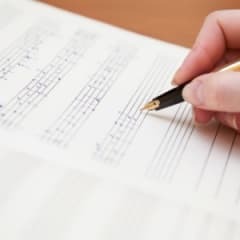 The scores written need to be technically correct in order to create flawless performances by choruses, musicians or instrumental ensembles. Sound recordings produced from the score vary in style and may reflect the classical, country, folk, jazz, techno or pop genres. A composer's job is to help tell a story in a film, television story, play or video game without distracting the viewer. The soundtrack they create must suit the project and convey the appropriate mood and tone. 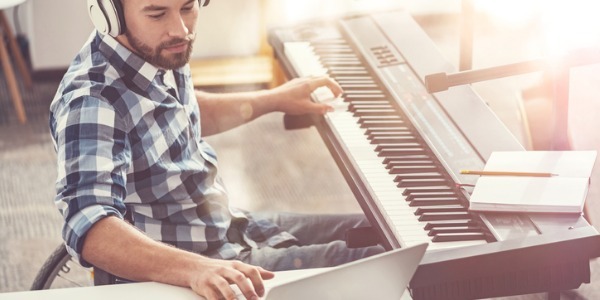 Successful composers are versatile with effective collaboration skills, allowing them to work on a variety of projects with producers and musicians from various backgrounds. They have extensive knowledge of the industry and a passion and talent for creating sound recordings. Most composers are often skilled in playing one or multiple instruments and have a good ear for music. Composers create and arrange musical scores for anything that requires a soundtrack. Movies, television shows, video games, plays, commercials, songs and orchestras all require composers to bring their projects to completion. Depending on the job, composers will work at home or in a studio to create, arrange, compose and direct original scores for various forms of media. The score might bring mood or emotion to a dramatic scene in a play or provide a tempestuous backdrop for a ground-breaking action scene in a film or video game. Typically, a composer needs to have a very good understanding of technical recording and sound equipment, as well as software used to optimize the sound of the score. Composers will also spend time meeting with directors or producers to discuss the requirements of their contract. Discussion focuses on subjects like the mood and tone of each scene so that the composer knows what direction the soundtrack or score should take. Scores will sometimes need revision and it is the composer's responsibility to produce a sound recording that will complement the film, television show, video game or play production. Are you suited to be a composer? Composers have distinct personalities. They tend to be artistic individuals, which means they’re creative, intuitive, sensitive, articulate, and expressive. They are unstructured, original, nonconforming, and innovative. Some of them are also enterprising, meaning they’re adventurous, ambitious, assertive, extroverted, energetic, enthusiastic, confident, and optimistic. Does this sound like you? Take our free career test to find out if becoming a composer is right for you. Composers traditionally contract their work with media or performance companies. After finishing one project, they look for the next, which could be with a different company or could even be in a different city. As a result, composers often work long, irregular hours at changing locations. When on the job, they write scores, or travel to and from rehearsals to direct and fine tune performances. In today's world of state-of-the-art technology, composers also work with advanced electronic sound equipment to perfect sound recordings on the digital level. Composers work to arrange technical aspects of each recording like harmony, rhythm, melody and tone, and then perfect them with highly technical recording equipment and software packages. No matter the origin of the composer, sound recording is in demand worldwide. Many composers will travel far from their home country to pursue their interest in film scoring or working with performing arts companies in major metropolitan areas like London, Paris or New York.